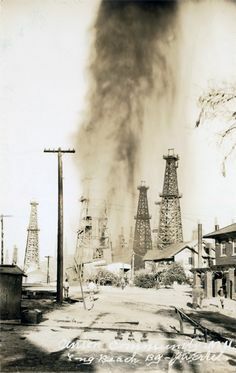 On this day in 1901, a drilling derrick at Spindletop Hill near Beaumont, Texas, produces an enormous gusher of crude oil, coating the landscape for hundreds of feet and signaling the advent of the American oil industry. The geyser was discovered at a depth of over 1,000 feet, flowed at an initial rate of approximately 100,000 barrels a day and took nine days to cap. Following the discovery, petroleum, which until that time had been used in the U.S. primarily as a lubricant and in kerosene for lamps, would become the main fuel source for new inventions such as cars and airplanes; coal-powered forms of transportation including ships and trains would also convert to the liquid fuel. Crude oil, which became the world’s first trillion-dollar industry, is a natural mix of hundreds of different hydrocarbon compounds trapped in underground rock. The hydrocarbons were formed millions of years ago when tiny aquatic plants and animals died and settled on the bottoms of ancient waterways, creating a thick layer of organic material. Sediment later covered this material, putting heat and pressure on it and transforming it into the petroleum that comes out of the ground today. In the early 1890s, Texas businessman and amateur geologist Patillo Higgins became convinced there was a large pool of oil under a salt-dome formation south of Beaumont. He and several partners established the Gladys City Oil, Gas and Manufacturing Company and made several unsuccessful drilling attempts before Higgins left the company. In 1899, Higgins leased a tract of land at Spindletop to mining engineer Anthony Lucas. The Lucas gusher blew on January 10, 1901, and ushered in the liquid fuel age. Unfortunately for Higgins, he’d lost his ownership stake by that point. Beaumont became a “black gold” boomtown, its population tripling in three months. The town filled up with oil workers, investors, merchants and con men (leading some people to dub it “Swindletop”). Within a year, there were more than 285 actives wells at Spindletop and an estimated 500 oil and land companies operating in the area, including some that are major players today: Humble (now Exxon), the Texas Company (Texaco) and Magnolia Petroleum Company (Mobil). Spindletop experienced a second boom starting in the mid-1920s when more oil was discovered at deeper depths. In the 1950s, Spindletop was mined for sulphur. Today, only a few oil wells still operate in the area.